Fly direct to the British Grand Prix, avoiding any delays. Experience the glamour and excitement of the British Grand Prix, as the Formula One™ drivers and teams fight for supremacy at Silverstone Racing Circuit – one of the quickest circuits around. Take your place to watch the action unfold. 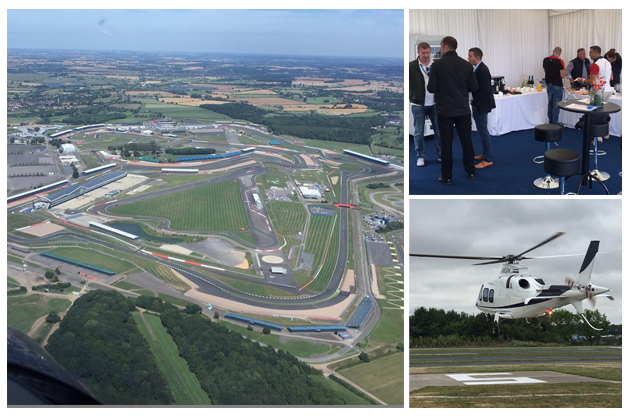 We have our own VIP arrivals lounge at the British GP Heliport at Silverstone where you will be treated to the best English sparkling wine from Hambledon, gourmet canapés and light breakfast. Prior to your departure, afternoon teas will be served with more sparkling wine from Hambledon . Our friendly Operations Team will arrange everything for you. You can depart from a location as close to you as possible and they will arrange the chauffeured transfers. Call then today on 0125 663 5000 and let the organise your whole itinerary. The Blue Ribbon event for any motor racing circuit, the Formula One™ World Championship will again be hosted at the home of British motor racing, Silverstone. Huge crowds are expected to attend, to soak up the atmosphere and to find out first hand who will be crowned champion. Fly over the queues and experience the style shown by Formula One™ drivers who also fly to the race track to avoid the traffic jams, enjoying the luxury and convenience of a private charter. Witness all the action from the start of the British Grand Prix by using the smart alternative, a helicopter to fly over the traffic jams so you are there for all the pre-race tension and excitement. The entire race weekend buzzes with expectation as the British crowd gets behind its heroes and you will be there on time to be part of the great day. Arrive in style, refreshed and ready for the day’s motor racing. 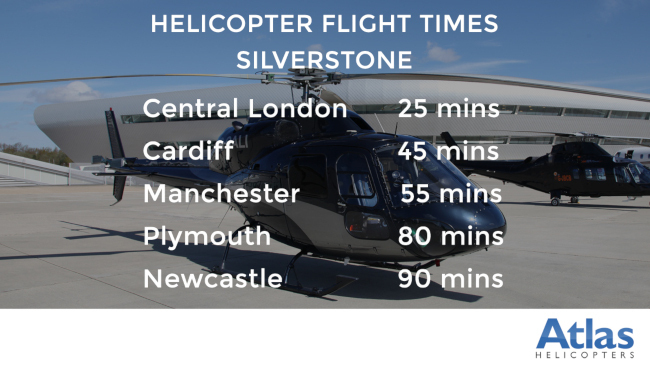 Enjoy the thrill of a helicopter transfer into the centre of Silverstone circuit; the World’s busiest airport on the day of the British Grand Prix. To reserve your helicopter for this busy and popular event please call our Operations Team now on 0125 663 5000 to book your place.